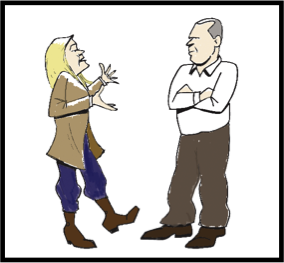 Are Contempt and Sarcasm Killing Your Marriage? Contempt is so destructive to relationships that we often call it the worst of the four Marriage Killers. A spouse using contempt places himself in a position of power above the other spouse. The contemptuous person believes they are better, more helpful, more thoughtful, more considerate, more punctual, smarter, cleaner, neater, etc. that their spouse. Contempt can look like put downs, “one-ups” and snarky sarcastic remarks. It can be as obvious as stating you think the other person is useless, worthless, or disgusting or as subtle as rolling eyes a sigh. What the victim of contempt receives is total disrespect and scorn. Frequently they feel like not only that their spouse does not like them but that perhaps they actually hate them and want bad for them. Contemptuousness can be delivered in a monotone quiet voice with little energy behind it. To an observer who does not understand the remark, it can look like there really is not much of a problem in the relationship until the person receiving the remark shows pain outwardly by facial expressions or by crying. We think the reason sarcasm hurts so much and is so destructive is that the victim rarely sees it coming. If someone came at you wielding a machete or chain saw, you would be prepared with your defenses up or be able to run away. Instead of coming at you with high energy screaming to let you know they are mad, the contemptuous spouse pulls out the scalpel of sarcasm and slices with precision very painfully in the place that hurts the most. The reason sarcasm is a Marriage Killer is because it frequently leads to limited or no communication about the issue. The issue becomes reoccurring and remains unresolved. A pattern of negative interactions set in and communication comes to a halt. Before long, hurt feelings and lack of engagement lead to the couple living lonely parallel lives. The end is near. If you are the victim of contempt, you are likely feeling a great amount of pain concerning what was said and/or how it was said. As a remedy, find a way to soothe yourself and get to a point where you can actually think about the incident without being triggered. Using Time Out skills will help you get into a place where you can have a conversation about the issue. It is important that you do two things. First, you will need to seek to understand the issue that your spouse has with you. Then, make sure you bring up the issue of how it was communicated to you – the actual contemptuousness you received. These two issues can sometimes happen in the same conversation but it usually takes two separate conversations. Find out what led to their decision to use contemptuousness. You can do so best by using your Speaking and Hearing Truth skills. Begin by stating what you saw or heard and ask your spouse for specifics around what the issue was that led to the comment. If you have to, use the Broken Record Technique. Some of you may be too young to remember, but when we were growing up in the 70’s, the needle on a broken record would get stuck in the same groove and replay the same short phrase over and over again until someone moved the needle to the next groove in the record. One of the things we have seen work with someone who has been snarky and sarcastic, instead of open and specific, is the use of the broke record technique requesting again and again what specifically they would like to see happen or not happen the next time. When the answer is, “I would like you to not be so stupid”, the spouse using the broken record technique would say, “and specifically, what would you like me to do or not do.” Listening for their answer will help you get to the issue that is under their contemptuous behavior. The second and crucially important step a victim of contemptuousness needs to use is the Complaint Formula. Here they can state very clearly what they observed in the contemptuous behavior and how it affected them. From there, they can make the request for how they should communicate about an issue in the future, without their contemptuous behavior. If you are gifted with a sarcastic tongue and you easily resort to contempt when dealing with an issue with your spouse, you are killing your marriage! Yes, you may actually have a higher IQ, be cleaner, etc… but along with those qualities, you will likely find yourself divorced and alone. Chances are high that you will think the same of your next spouse as well. You need to decide if you want to always be better than your spouse and compete with them, or if you want to stay married. Life is so much richer with a long-term relationship. Having an equal partner in the marriage is a great blessing. You get to decide if you want to have your spouse as an equal partner. You can continue to drive your marriage into divorce court with your contemptuous behavior, or you can resolve to do something different and make a change. It is difficult to think so lowly of your spouse and at the same time feel appreciation. Consider looking for the positives in your spouse and developing an Appreciation List of all the qualities and things you appreciate most about them. It will always be easier for you to resort to contemptuous behavior rather than face head on the issue with your spouse. Your marriage will thrive if you can replace your contemptuous ways with real, issue resolving conversation.